This site will serve as my blog for all the lessons learned about Tarantula Husbandry. I have been, like many people, terrified of spiders most of my life. Yet, somehow always fascinated by them as well. I had been watching more and more keepers on YouTube and thought, what the heck. 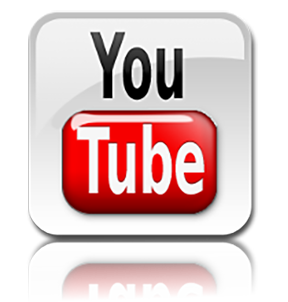 (5) new YouTube Videos now up. 2018 07 14: Everybody seems to be doing ok.
2018 07 06: I appear to have lost two slings. I was doing some feeding and some maintenance when I decided to dig out the only two slings that I haven't seen in quite a while. 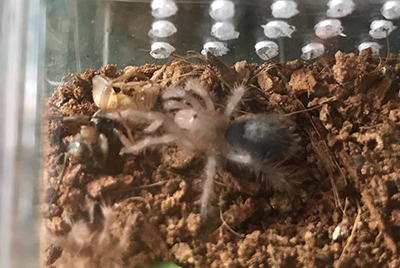 Those were the Brachypelma Albopilosum and my Acanthoscurria Geniculata. I'm sad to say that I could find neither, or any parts of them, in the substrate of their respective enclosures. This is so strange. I thought I might have found a carapace or something, but nothing in either. It's not the money, that is the cost of the slings, that bothers me as much as I don't know what I could have done to save them, if anything. The only thing I could think of was to be more aggressive about knowing what their status was, to check on them by doing a physical inspection. I know slings will burrow, and I remember being concerned about the B. Vagans due to how long it was MIA. Perhaps I should have dug them out earlier? I know going forward I will be more likely to do so and to be more vigilant regarding keeping their substrate dry. I have read how wet substrate can promote mold and mites, and those can kill a sling. I've read and know slings can die from a number of different reasons, I was just not prepared to lose two. Adult or juvie Ts are certainly easier to care for. So much for my being proud of myself for no deaths under my care. After the loss of two of my slings, I decided to not take any chances with my baby Avic. 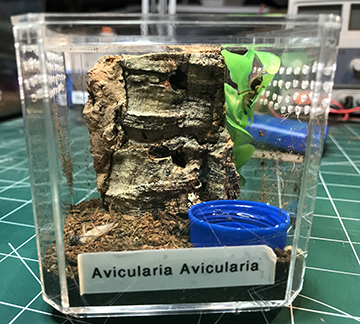 I modified a baseball sized display case as best I could for an arboreal sling and moved him/her in. The video of my doing so will be part of a feeding compilation video I hope to publish within the next week. So much to catch up on. It's only been a month and I've done more than I thought I did or had time to do with this hobby. I've been spending more time on the forums. Principly just to get familiar with these and see how useful they really are. I've been trying to follow my favorite YouTube keeper channels. I actually purchased (4) new slings becuase of an unboxing I saw. I got these from Palp Friction. Good experience, no issues. I've been giving some additional thought to the layout of this site. I have to develop the gallery and figure out how I'm going to archive the blog entries. I don't what the visitor coming to a home page, only to have to scroll down forever to get to the relevent T species updates. I would like to enable the search function. Maybe create a separate links page. Given the time, I'm certain I beef up this little blog site. Time is always the issue. After the traumatic experience of loosing two of my slings, I started to obcess regarding the well being of my remaining stable. 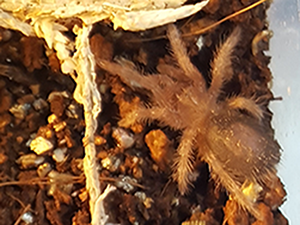 So I rehoused this little one just because some of the substrate was looking pretty damp and I have concluded, (regardless to what extent the logic followed is valid) that wet substrate was a contributing factor to my losing the other two slings. I have written about this one in a while. He/She seems to be a very slow grower. I've read that you may need to "will" some of your collection, depending on your current age, (a very serious possibility for me) and this little one may qualify. He/She seems to be doing fine. My Daughter has Named this one: "Phil"
After the loss of my two slings, I decided not to take any chances with my baby Avic. I performed some research on the Arachnoboards and online in general and finally decided that a modified baseball enclosure would suite her nicely for the time being. It is another interim solution wbut with less substrate and a small cork bark background to climb, it would be safer for him/her until I can get something more vertitcal. I ordered a set of (3) AMAC boxes and will see how those fair when they arrive. They're about 7" tall, so that is better than the current enclosure, height wise, but I'm unclear how problematic opening it to feed my sling will be. This little one seems hardy enough, and fast. It got loose twice while I was trying to re-house it. Thank goodness it stopped after a quick burst each time. If it had kept going, I might not have been able to recapture it. It likes to crawl up the paint brush I was using to gently guide it. This little one was running up and down my arm. Another first. All in all, it seems to have adapted well enough. It has been hiding in the fake plant leaves, toward the top. It probably feels safer now than at any other time in my care. I like this genus and this species. They're beautiful Ts. My daughter has named her "Ava"
She had a couple of these and I bought one from her for $40. 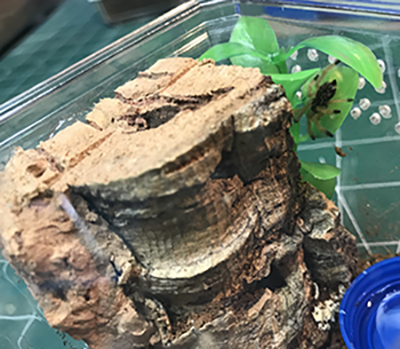 A 3 inch tarantula for $40? With all 8 legs? I thought that was more than fair and definitely worth the risk of going to a private breeder. She showed up, I unboxed her and she has been an absolute sweetheart since her arrival (the video of her unboxing is on my YouTube channel). She is slow moving, very deliberate. No threat postures thrown, no hair kicking. She hangs out most of the time, but will return to her lower income housing (the detergent measuring cup I used for a burrow) when frightened. This is the kind of animal you just want to pickup and hold in the air. If it were pheasible, an affection squeze or hug wouldn't be off the table either. She really hasn't pounced on anything yet. Maybe she doesn't care for crickets. Which reminds me, I'm in the research stage of starting my own Dubia colony. I've also heard B.lateralis are supposed to be a good choice too though. I will have to check on that and report what I find out. 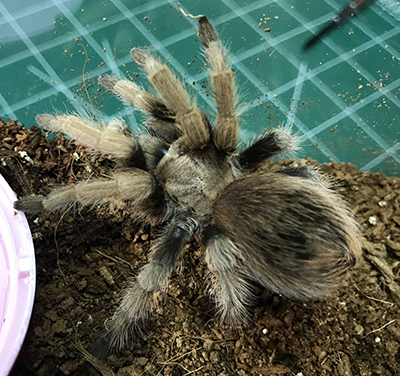 My daughter has named her "Colette"
I bought this sling as the other that I started my collection with from fear not tarantulas (see link below) at the suggestion of Tom Moran from Tom's Big Spiders (link also provided below). Here is the latest baby picture of one of my two slings. He/She's pretty content to remain in the open and was observed enjoying a 1/4" banded, prekilled cricket this week. I'm really happy about that. This is one of the four slings I purchased from Palp Friction. To date, the two I lost were from this same transaction. I'm not blaming the vendor. I have no clue as to what happened with those other two, but this one and the remaning baby Avic seem to be doing well. When I received this sling, I placed him/her into its enclosure and have not seen it since. I wrote to Tom Moran from Tom's big spiders and was re-assured that this is very typical behavior. Appearently these guys like to burrow. I've been providing it food and water and am remianing vigilant. My daughter isn't as willing to be patient, however and roosted the little guy's enclosure looking for him. She reported he was under the cork bark, so I have that. I'm sure I'll see it again soon. It will undoubtedly molt and get larger. Its just annoying that I can't see it now. Thank goodness for the GP's tendency to remain in the open.